It certainly isn’t a routine yet, but were are comfortably settling in. Maureen returned to work in the convenience, liquor, stores and laundromat and I did a few more shuttles. So far the shuttles are used to move vehicles, usually with a boat trailer, from an upstream boat landing to a downstream boat landing. While we’re doing the transporting, the customers are floating down the river, enjoying the scenery and the experience. There’s no serious fishing on the river yet. That starts for real on June 11 when the salmon fishing season opens. That will cause the transporting and taxi activities to explode. One of the more popular routes is to pick up the vehicle at the Resurrection Trailhead here in Cooper Landing and bring it to Hope. 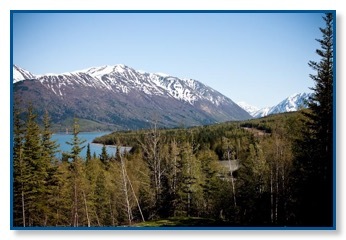 For the hikers, there is a combination of cabins and campsites to provide stopping points for this 39 mile trek. 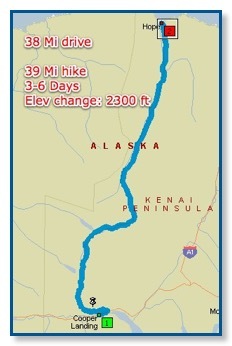 This 3-6 day journey reaches 2,600 feet which is above treeline. As a reminder, Colorado treeline is typically 12,000 feet. This trail is populated with an abundance of wildlife such as marmots (aka bear burritos), Dall sheep, brown bears and an occasional caribou. 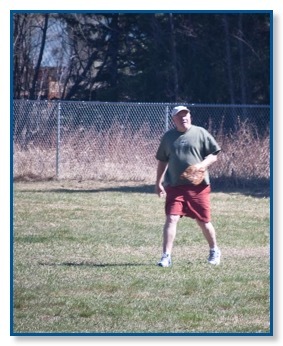 The big news of the day is that I joined the Wildman’s softball team. What an experience! As I was standing in left field, Maureen yelled over and pointed to the sky. 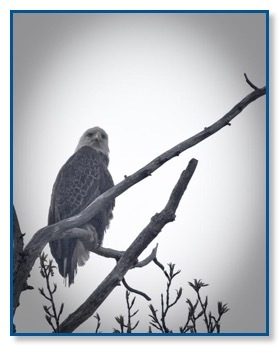 I stood mesmerized by a fantastic bald eagle soaring around our field. Maureen said that I looked like a 5 year old little leaguer looking at everything but the game. Check out the video to see the setting. The field is a bit ragged at point, but it sits amid mountains, many snow capped, with the Kenai River just beyond the right field fence. This all culminates in a tournament played over a weekend late into the evenings. Lights aren’t needed because it won’t be geting dark until after 11 PM. 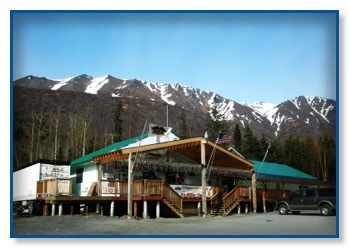 Actually, even bigger news, I’ll be getting some network goodies to provide WiFi to the store and to the RV area. This will preclude us having to drive an 80-90 mile round-trip to get effective WiFi to maintain this journal. We are very psyched to get that done. With any luck, the next update you see will be from our RV.